January was a good month for RuneScape, even if you weren’t a fan of the heavy cash shop promotions. As I do each month, I’d like to give my thoughts on each week’s updates. Boss pets for me will fall under one of the more important updates of the year next to Jagex’s upcoming non-Java client launch and hopeful removal from the bloat that currently plagues this game, and it is an update that I haven’t even participated in yet. The idea of adding more cosmetics to collect is rather inconsequential when this update introduces a mechanic that hopefully will be expanded upon in future content, and one that I have personally been shouting from the rooftops for for the past several years: Thresholds for inconsequential, character-bound cosmetics. If you don’t know what I’m talking about, they basically work like this: Graardor has a 1 in 5,000 chance of dropping a pet, but should you manage to hit one thousand kills without a drop, the rate gets better. Now you have a 2 in 5,000 chance (1 in 2,500) until you either get the pet or the threshold caps at a generous 10 in 5,000 (1 in 500). You may still, by the wrath of the random number generator, never get that Graardor pet, but your odds do go up considerably and it doesn’t take away from the drop because you still need to kill this boss nine thousand times to hit that rate, after which I think we can all agree you deserve a break if you still haven’t received your fancy pet. And it doesn’t devalue the achievement. As of January 29th, only two of the 26 pets have been unlocked by more than one thousand players, out of the tens of thousands who play every day. I don’t have enough knowledge of the drop tables to comment on this update, but the most important parts can be found in the “other news” part of this update. Clan citadel updates, reducing upkeep costs and removing the probation period on new members. You have to have played to know how sour clan chats could get each week when the citadel came due and not enough people spent the mandatory six hours of extremely heavy grind to grab the hundreds of thousands of resources required to keep the clan’s avatars for the next six days. If I want someone breathing down my neck to maintain quotas, I’ll go back and work for Target selling credit cards, at least I’m the one getting paid there. Once again, not the important part of the update. Hati and Skoll are pretty insignificant, an annual update that takes five minutes to complete and awards a chunk of bonus exp and cosmetics that you won’t wear. The update did, however, introduce RuneLabs to jump start players introducing their own ideas to the game. Most of them are godawful, but the community so far has been doing a great job of allowing the best ideas to filter to the top. I stopped using ports pretty much immediately after they came out, so I have a long way to go before I can catch up to the launch content let alone what this update brought in. 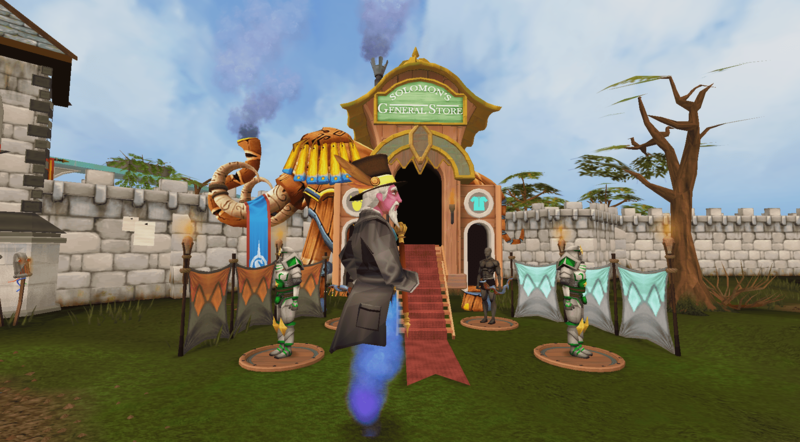 As easy as travel is in RuneScape, it was still a pain to have to go to your port every single time your ships came in, in a mini-game that is already incredibly time-intensive not unlike your average Facebook waiting game. Now you can manage your ships from just about anywhere, and the simple fact that this update made me engage in something I had previously dismissed makes it the top feature of the month.